Let's be honest: you don't want ideas that are going to prevent you from parking your car in your garage because after all, that's what it's there for. 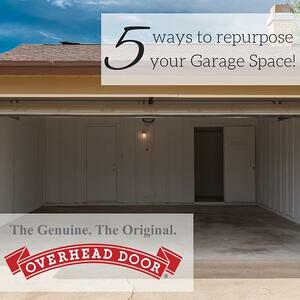 These 5 creative ideas can help you clean up clutter at home, capitalize on extra garage space, and still park your car there, if that's what you want to do. The garage is a great place for a home gym. You can turn the music up, open the doors for fresh air, and work out...maybe even uninterrupted. Lay down a shock-absorbent gym tiles, move your equipment out, and you're set to go. If your kids have skateboards, hover boards, roller blades, or bicycles, and you live a climate that's angry in the winter, your garage is the perfect place for your kids to expel excess energy and get some exercise when there's snow on the ground. No prep is needed! A fridge, a big screen TV, and some seating is all it takes to use the open stall in your garage as a place to host guys' night. If you have more space, consider air hockey, pool, or a card table, too. Is your home overtaken by sewing and scrapbooking supplies? If so, consider using part of your garage for craft supply storage and a murphy-style craft table that can be tucked away when not in use. Storage shelves suspended 18-24" from the ceiling of your garage can add substantial storage (a perfect solution for those totes of holiday décor) without taking up any floor or parking space at all. If your garage is wide enough, you can bring the shelves all the way down to the ground. At Overhead Door of San Angelo, we're experts in creating show-stopping garages that are functional and still show up the neighbors. Contact us today to learn more or get started.